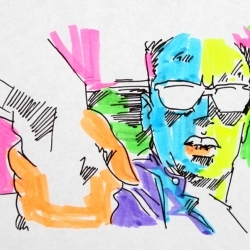 The Schwarzenegger Trilogy - The 3 short animations all hand-drawn 1600 frames cell animation with Highlighters used for color. The 3 short animations all hand-drawn 1600 frames cell animation with Highlighters used for color, it was hell to make but we love the final videos! The short films premiered at the Standard Hotel in Downtown Los Angeles as part of Cine-Shorts which is a bi-monthly series that aims to provide a platform for local directors + aspiring filmakers making their mark in the city of los angeles.